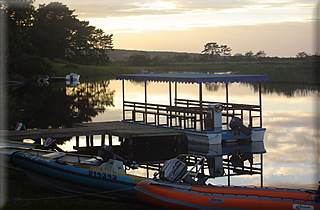 Riverside Holiday Resort is situated on the banks of the Little Brak River, six kilometres from the Indian Ocean and Little Brak Beach.The river is navigable for twenty kilometres and teeming with fish, which means there is excellent boating, fishing and canoeing to be done. Birdlife is rich and varied, and bird-watching is therefore rewarding.The local Little Brak beach is safe, uncrowded and offers surf and rock fishing as well as the chance for whale watching in winter. In Mossel-Bay(18 kilometers away) surfing and deep-sea fishing are both recommended. On top of all this, Riverside is an ideal base for exploring the beautiful Garden Route and the Little Karoo. Game drives are also available at the Botlierskop game reserve 5 kilometres from Riverside. So If you can't choose between mountains, rivers, forests and the sea, come and enjoy them all at Riverside. Send mail to pcd_agency@intekom.co.za with questions or comments about this web site.